Amazing work! 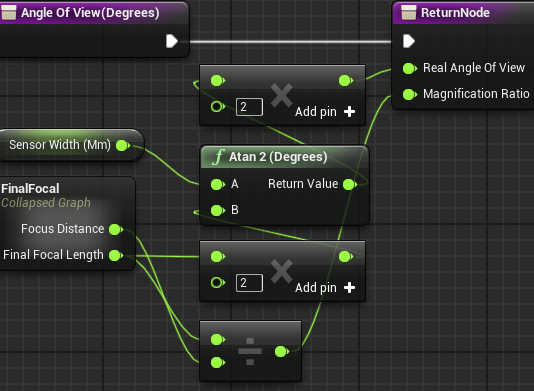 would you share the blueprints you used for the camera? The original Unreal 3 scene (which is all those assets and arrangement) were build at the end of 2010, after I finished the last Bioshock 2 DLC. Will share the information when I write the technical breakdown for the scene creation. I have few problems with the camera system itself that I hope by sharing it gave me some feedback on how to solve it. I'm really curious about the modification on the camera actor...I mean, the actual focus is always done in keyframes or the modification on the class improve some aspects? Inspiring work! I really love the feel of the camera shots! Beautiful work, only thing I see is that in the last pic you might want to bring in the camera a bit since you can see some areas where there are fewer details(trim, rubble seams, etc.). Every other picture looks excellent! Technical breakdown of RinCity Train Station. A. Unreal 3 to Unreal 4 asset conversion. B. Physical Based material cheat/shortcut (Master Material). C. HDR lighting n Lightmass. D. True focus Camera BluePrint. F. Summary for the conversion. 2. There's no longer VERTEX Lighting bake support. (this took me 5 days every night to complete LM for all the assets). 3. There's no spline actor to mesh conversion export from UE3. 4. There's no BSP UE3 to UE4 export. 5. Location and rotation from the original scene. 7. Scale in UE4 finally do 1 unit 1 cm. 1. Having all my MAX source files, makes this a non issue. 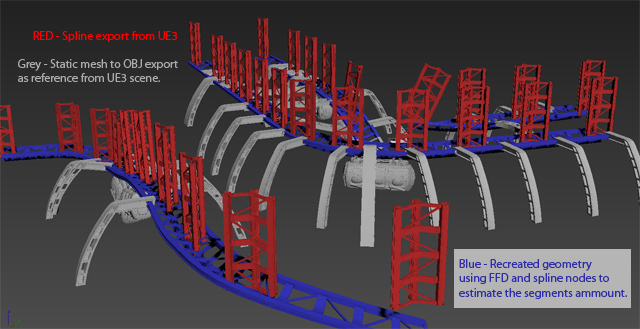 Make profile for FBX generic static mesh export in MAX to speed things up in export. 2. No vertext lighting, means lightmaps (spelling this gave me a headache already lol). 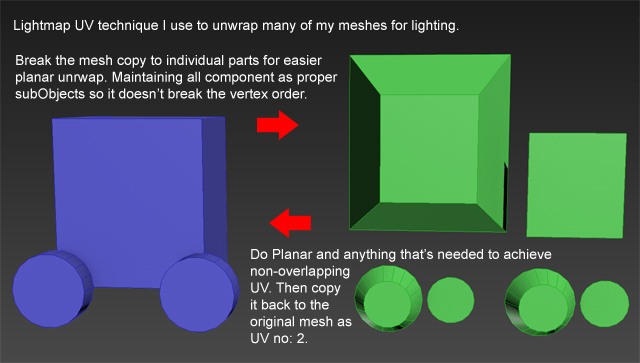 The technique I use is to break the geometry, do UV unwrap in planar as much as possible, then copy it back to the original mesh as UV2 (or whatever desired). 3. Spline is used for the UE3 hanging rail. Spline actor export from UE3 only shows the spline point, and doesn't show anything other than that. The way I solve this is to export part of the scene to obj and recreate the spline object as best as I can and export it as a single static mesh for UE4 (and lightmapped it too off course XD). cleaned the triangle, set proper Material IDs and finally lightmapped it XD. - Extract the Location and rotation coordinates. - Convert the rotation from integer to degree (in this case UE3 Rotation/65536*360), depending on how many object I was converting from I might sometimes use excel to to batch number conversion. 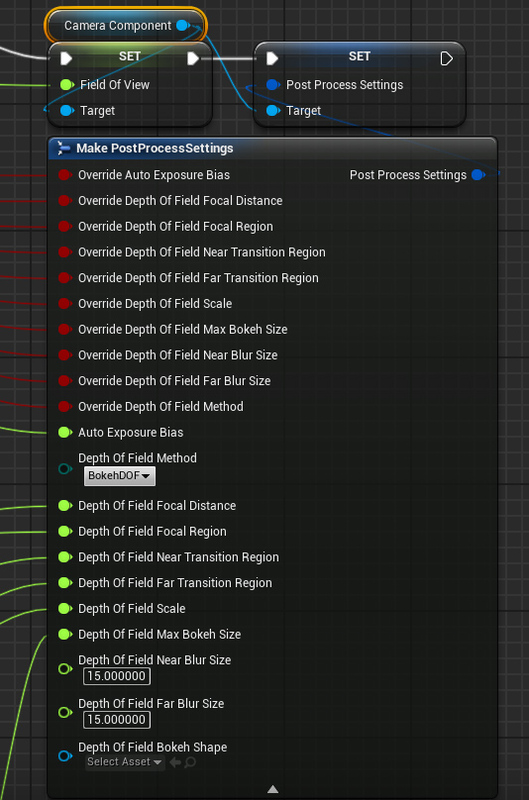 - Then duplicate the same number of that particular static mesh in UE4, paste it in notepad and replace the Absolute Location and Absolute Rotation with the one I've prepped from UE3 extraction. 6. Vertex painting for the object for material blend is A LOT OF INFO to copy. It gets to the point that it'll chug your Notepad scroll. Because of this I decided to just do vertex repaint in the UE4 scene. 7. Ok so now all my mesh are half the size than the intended scale, but considering the amount of time it took to bake the lighting, I dediced not to do 2x scaling as I'm not planning to walk around in this demo. I did found a way to scale it to proper 2x by using attach to function. (basically select all object, then attached it to a box that has 0,0,0 coordinates, then scale the box to x2 and then voila). 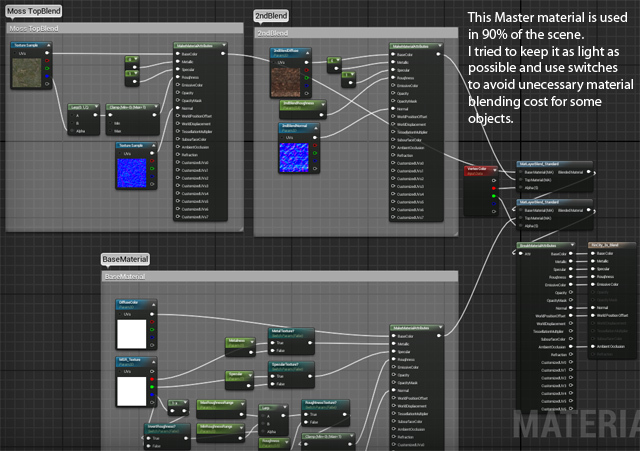 In my scene I create a basic master material that I use for 90% of the scene assets. I would like to save time as much as possible, hence I didn't do much with the diffuse texture and normal map. I did some metal parameters textures and use as much as specular mask from my old scene as my roughness base as possible. I use a simple lerp function and 2 constants to control my roughness that's derived from specular mask. 3. Paralax shaders and water movement for the underground surface. 4. Light functions for the clouds. 5. Car shaders that comes color changing parameters. C. HDR Lighting and lightmass. Lightmass took forever to build lighting, to mitigate this, I did a quick simple evnrionment with box (that built less than 30 second) to estimate the light color and value for the scene. *It took 23 hours on the build where I didn't know the previous light build busted my cpu radiator coolant, my poor i7 building lightmass under fire lol. In properly cooled machine it'll roughly render around 5 hours. As you all have known, HDR if you're not careful can be a double edge sword. People get confused on what value they need to put in the light intensity. If you were to make a scene with proper light bulb and sunlight and time of day cycle, you need to make sure you know what's your light bulb ratio towards the sun and moon and what type of light you're using. I think it's best to measure light in Exposure value range considering we're dealing with HDR. Here's some technical value that I found out that might help some people figuring out their lighting. - In the case of Spotlight/PointLight w/ inverse sq. falloff it'll be measured in Lumens. (if I have to guess that Unreal 4 lumens is based on lux/1m² surface area of a sphere intensity, roughly 0.282m radius). - If you didn't activate the inv. Sq fall-off, your intensity value is the origin point of your light and fall-off according to radius and exponent. - For Lights with inv. sq, the intensity at 28.2cm of the lux base is a multiplication of 20x. - With Exposure value, Each time you want your lighting to go to the next EV brightness, you need to double the value of your light. (eg. base light 1, to make the second light 3 EV brighter, you need to put value of 8 [3 power of 2]. Why are the real internal value important? 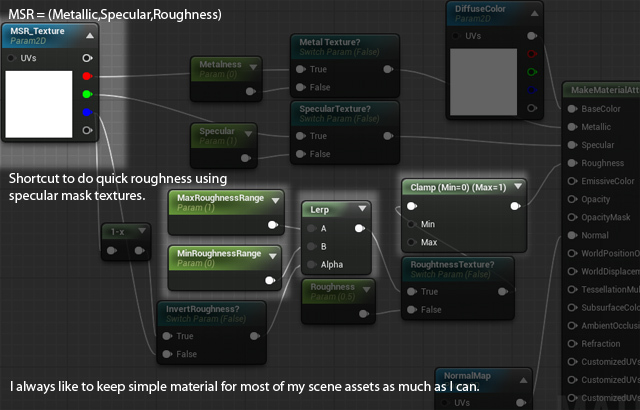 People who do real world lighting and photography exposure will understand UE4 lighting easier than others. In the end, it's all about light Ratio. Since I'm not trying to match proper light bulb value with my sun, I didn't use the real sun value (which if you were to go with sun typical EV 14-16 = 40,960 - 163,840. Directional light 768 and lightmass Environment scale 96 rather than dealing with extreme numbers value. At the end of the day as long as your light ratio is proper and you set the eye adaptation limit properly, it'll be the same regardless the EV level you use. The idea is to animate the camera using real world variable input and capture some of the proper camera characteristic. The closer you focus, the narrower the FOV supposed to be and vice versa. For the effective focal length I use thin lens formula to keep things simple. For some reason unreal FOV description said it's Vertical FOV, but after testing I figure it is a Horizontal FOV, so you can hooked this final value directly to the Field of View of the camera. So those pretty much handle the effective focal length based on Focus distance and Lens focal length. Things gets complex when trying to control the DOF and I believe I might get things wrong here (I'm looking for discussion on these for UE4 implementation). 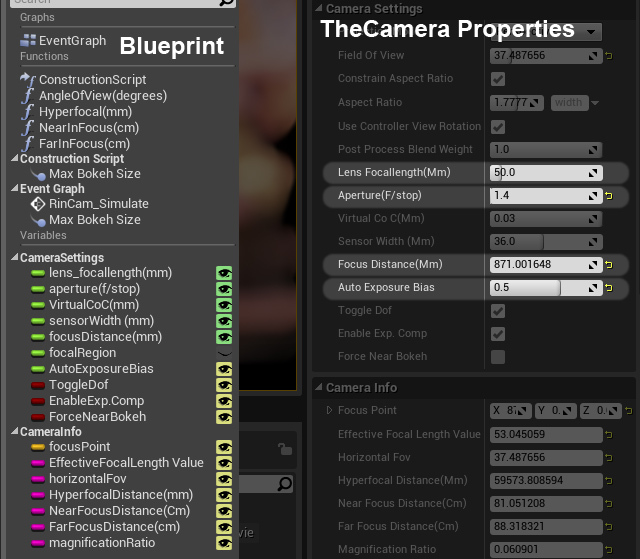 and focus point with the Df for Far Focus range and feed it to unreal DOF parameters. This confused me as I think there should be FAR max bokeh size and NEAR max bokeh size. In this case I just do a calculation for Infinity Bokeh size. And that's it for the calculation. Congratulation for reading up to down here. 1. The BP camera actor "constructscript" DOF effect can only be previewed when you preview the camera actor from Matinee actor. 2. Well construct script don't run in runtime lOl so you need to duplicate all those stuff into event graph and make it run. Unfortunately you can't TICK Blueprint based on camera Actor. 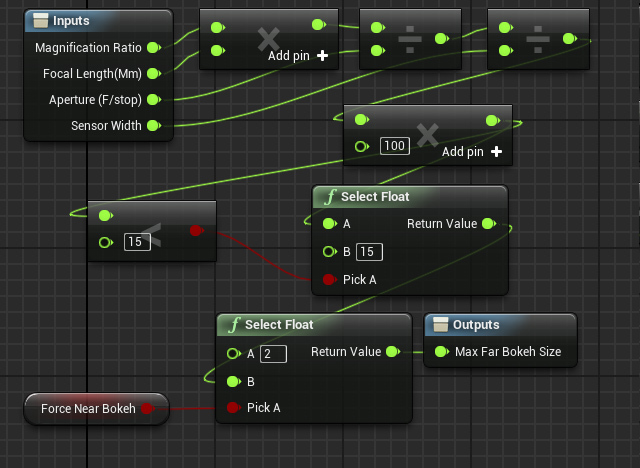 Making this entire thing from Actor based BP and add camera to the component doesn't allow you to adjust post process, a.k.a useless camera BP. I solve this by doing a custom event that I called from Level blueprint. 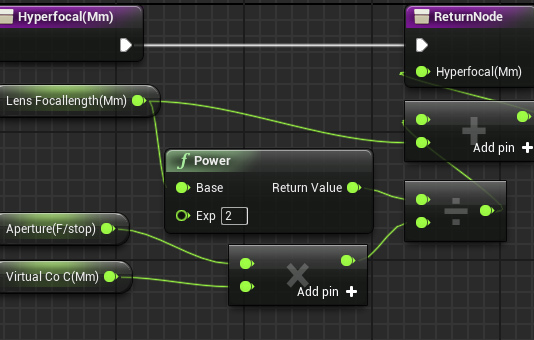 In level blueprint I run a ticker that called that camera custom event. 3. The BP camera actor keyed variable does NOT reflect in the viewport during playback/scrubbing in Matinee. To preview the whole scene, you need to close matinee, run simulate, then open matinee and playback (it'll play for 2x speed for some reason) to see the result of all your key. These settings for real size bokeh is typically only used for Cinematic and not in game as it can be very heavy in perf. I didn't post my original BP because it's kind of hairy and it has some extra info for personal test so I post only the important nuggets in this breakdown, but should allow people to re-create the camera if needed. At the end of the day this small project turns out to be quite a task to complete. Unreal 4 Physical based shaders, HDR lighting, Tone Mapper curve, Temporal AA and blueprint blows me away. The only thing I wish UE4 had in the future is either GPU Based Lighting baked (like Octane render) or realtime precalculate radiosity that's stable and light in performance like Enlighten. I'll post some screen comparison between UDK and UE4 version at some point in the future. Thanks for looking at my video post and reading the breakdown. Last edited by RinDreamX; 10-07-2015, 07:02 PM. Reason: Correction on EV information. A work of beauty, well done!